This Vauxhall Mokka is available in Silver, Black, White, Red, Blue other colours and lease options, subject to availability and includes a warranty. 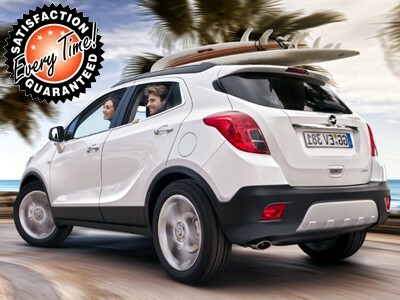 The Vauxhall Mokka has a great appeal, a good all round SUV for fun days out. The Mokka has great good looks too, is pretty practical and some versions are reasonably priced. You should get a hefty discount, too. Which Vauxhall Mokka are you going to lease today? We offer top quality Vauxhall Mokka from brand new, nearly new, slightly used or ex demo, whether you have good or poor credit rating, pay a low or no deposit. These Vauxhall Mokka can be leased or financed and come with a warranty, HPI checked and when contract hire leasing, include UK nationwide delivery and AA or RAC Roadside Assistance cover for peace of mind. Time4Leasing can offer you the latest Vauxhall Mokka lease deals at lower prices because these vehicles are exclusive and offered at lower rates to customers that have good, poor or even bad credit history score ratings. The Mokka isn't without appeal. It looks good, is fairly practical and some versions are reasonably priced. However, Vauxhall’s SUV doesn’t do anything better than a Nissan Qashqai or a Skoda Yeti, and in several key areas, it’s a long way behind them. If you’re a company car driver, go for the 1.7 diesel in Tech Line trim. CO2 emissions of 120g/km and a low list price keeps Benefit in Kind (BiK) tax bills fairly low, but you’ll still get plenty of kit, including sat-nav. However, the diesel engine is quite noisy, so if you’re a private buyer we’d recommend the 1.6 petrol. It’s smoother, quieter and much cheaper to buy. There are 57 Vauxhall Mokka Lease Deals on Offer.